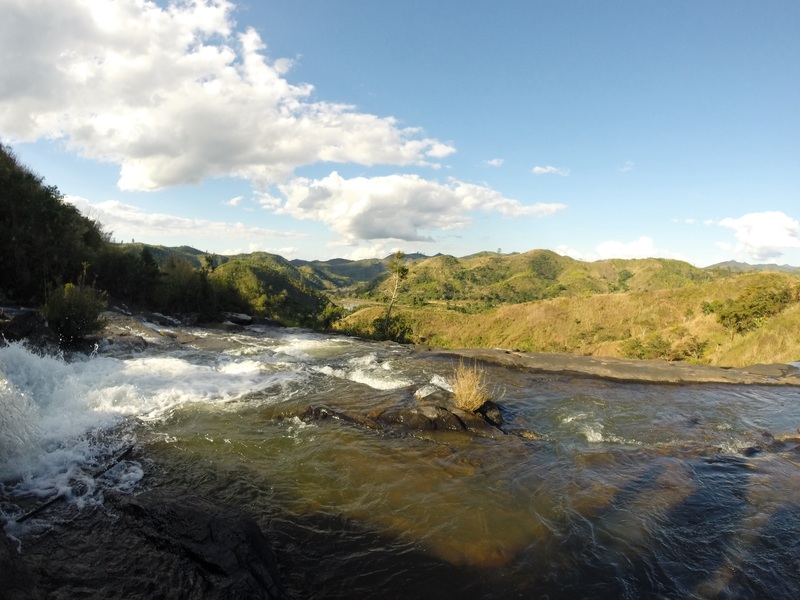 In May 2015, Dr Stephen Spencer led a team consisting of the Manchester medical students Hannah Russell, Anthony Howe and James Penney to study schistosomiasis in Madagascar. Read more about their trip here. 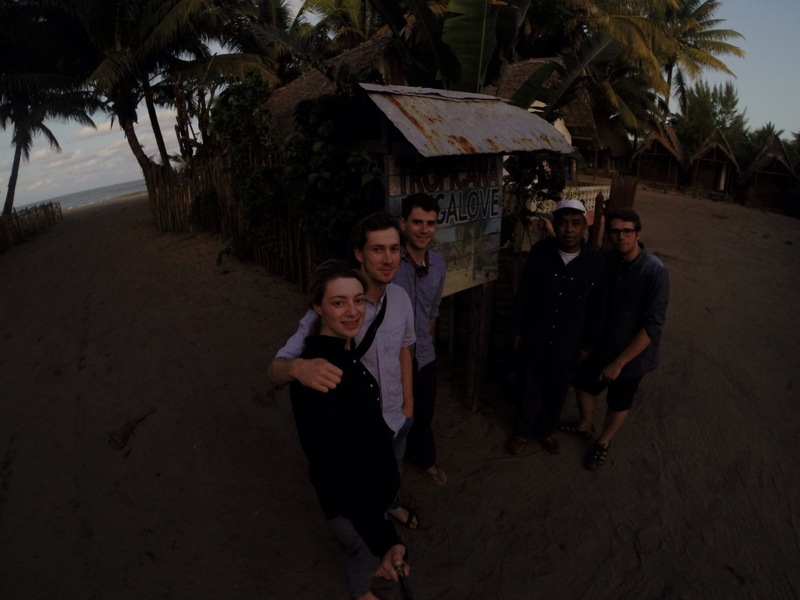 Greetings or ‘Manaonu’ from Madagascar! We’ve made it as far as the Indian Ocean, and have a few days in the small town of Mahanoro before heading into the isloated district of Marolambo where our real work starts. The cyber cafe I’m writing from is a wooden hut on stilts, surrounded by chickens, children and dubious smells. Needless to say the connection isnt brilliant, the keyboard is pretty dodgy, and we want a stroll along the beach before the sun sets ever-so-quicklily, so heres a brief bringing of things up to speed. The last couple of weeks in Manchester were completely manic. Finalising Madagascar came at the same time as all of the end-of-year activities – final exams, moving house, goodbyes, barbeques, parties and cricket matches which couldnt be missed. Around this we had to make sure all plans were watertight (or thereabouts). For me sorting out our methodology this included ordering urine filtration kits from South Africa, antigen testing kits from Seattle, and sending pots of staining chemicals to Madagascar via DHL special delivery, and I lost track of the host of other logistics that Hannah Steve and Anthony had to sort, from finalising permits, to working out where we could find a generator to lug around with us once in situ. Finally the day came and we set off from Didsbury on Monday 8th June, leaving a post-parklife and pangaea Manchester. My sister Ellie came to see us off at Heathrow, surrounded by our 9 enormous bags of luggage (looking like silk-wrapped hobbits in their protective clingfilm packing to avoid being tampered with enroute in Nairobi). Very excited, pretty nervous, fairly confident we’d forgotten something, but also elated with the realisation that there was nothing more to could do until we landed, we had a last Cafe Nero chai latte before boarding the plane for the Land of the Lemurs. We arrived safely in the capital city, Antananarivo, and into the comfortable hotel, Tana Jacaranda. A feeling of great relief, achievement following over two years of planning as well as a sense of excitement about the field work ahead. First, we had four days of meetings as well as retrieval of a signed work permit! Our first rendevouz was with Dr Alain Rahetilahy, the head of control of neglected tropical diseases in Madagascar, and our primary contact in Madagascar. We finalised our research methods and arranged the retrieval of 4000 tablets of Praziquantel (the treatment for schistosomiasis), donated by the WHO for our expedition. Another taxi lead us through the markets and side alleys to the Durrell Foundatrion office. Here we met with Richard Lewis; Head of the Durrell conservation organisation, and his team, to finalise our itinerary and logistics for work with the people of Marolambo, where Durrell work in the Nosivolo river is highly active. 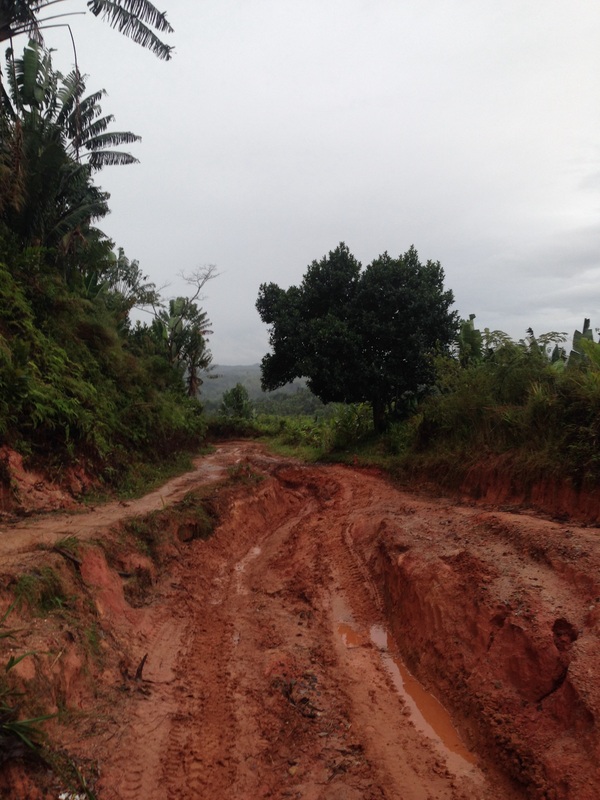 We learned that Marolambo is one of the most isolated parts of Madagascar, and the road to it; long and arduous! Day two involved a meeting with the Director General for Health. Dr Alain introduced our team and project and after a couple of minutes her smile and signing of the permits felt like a huge milesteone finally achieved. She expressed her desire to make this a long term collaboration and expressed the importance for a follow up expedition. A short trip by taxi took us to the University of Antananrivo to meet the Dean of the Medical Faculty, Prof Luc Samison. 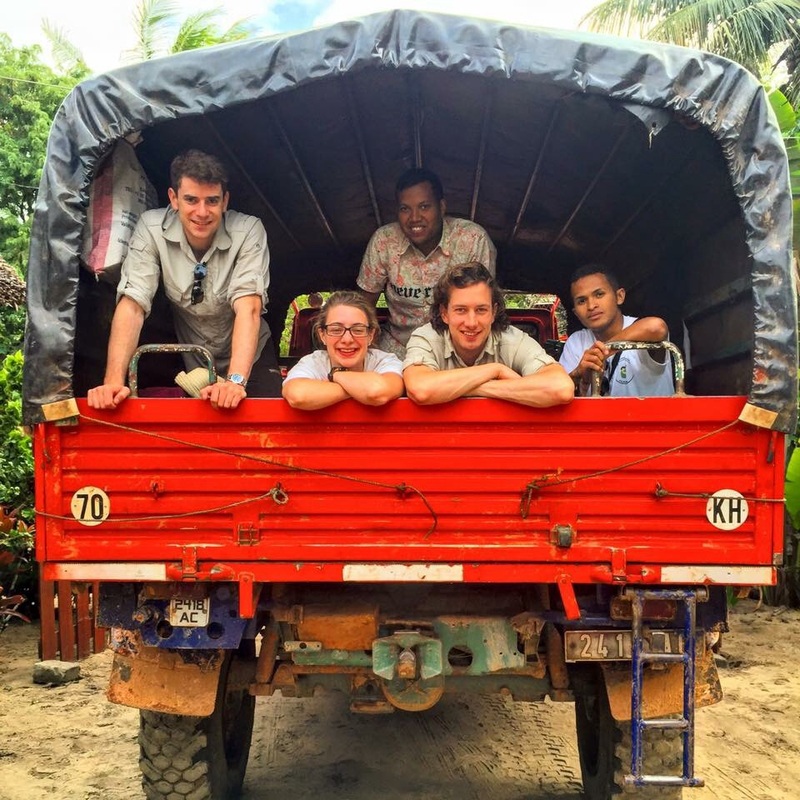 He introduced us to four medical students/doctors who we interviewed, and selected two to join the team (Daniel and Anjana). 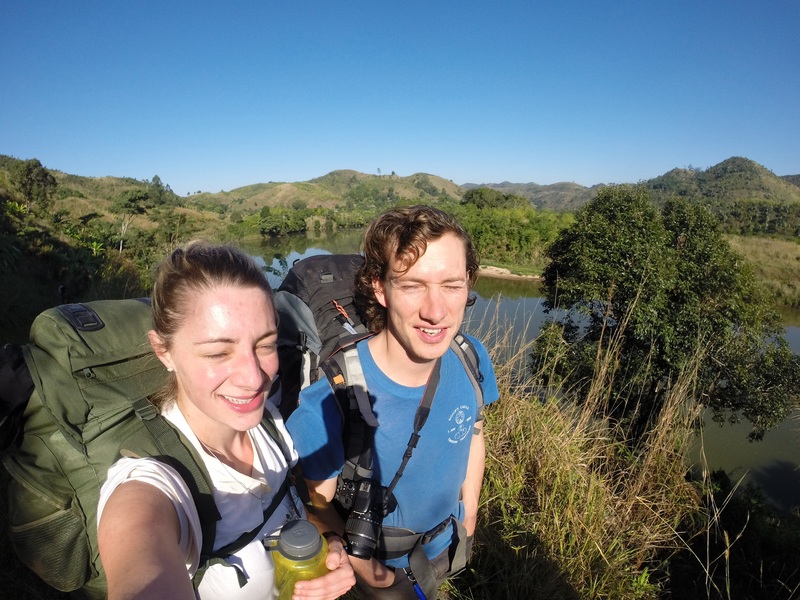 On Day 3, back to Dr Alain’s office to pick up four boxes of Praziquantel and he confirmed he would join us for the first leg of the trip – Andasibe and Mahanoro. We decided to split the team for the afternoon as increased efficiency was needed in preparation for departure the following day. James and Anthony went shopping for the generator (needed to supply the microscopes) and remainng kit. James and Anthony went shopping for the generator (needed to supply the microscopes) and remainng kit. Meanwhile,Hannah and I took a taxi back to the Durrell office to confirm arrangements with the Malagasy students,introduce them to the Durrell team and buy a Malagasy flag for the tent! For our final evening in Tana, Rob Gandola (Irish crocodile researcher) took us to a local restaurant where the ex-pats meet every Friday. We woke early and hopped into a taxi brousse. The driver played a tape with a mix of Malagasy and French songs, before the likes of Whitney Houston and Elton John took over. 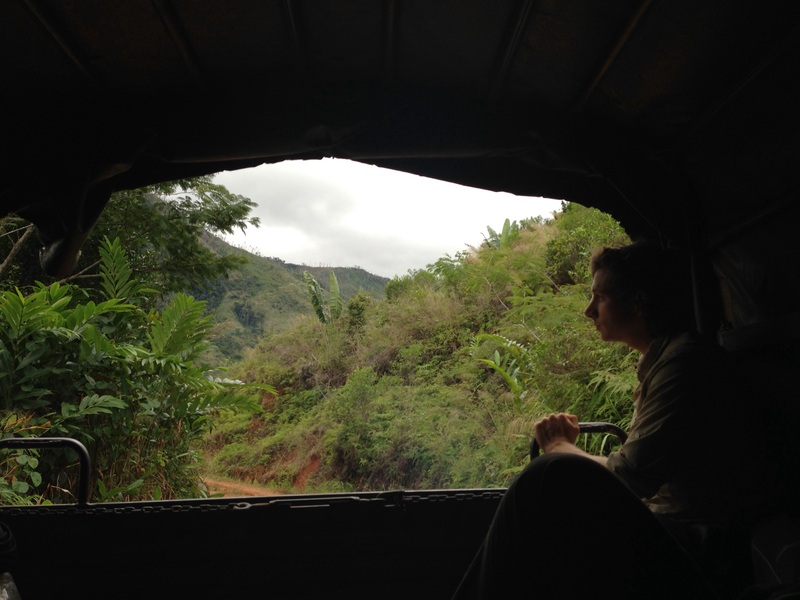 We stopped overnight in Andasibe and squeezed in a night walk in the rainforest where we saw some amazing lemurs. Eventually, we arrived in Mahanoro in time for dinner The next day and headed to the local restaurant ‘J’adore’. After a bite to eat, we joined in with some karaoke and had some good dance offs with locals. One of my favourite moments so far was when Dr. Alain took the mic to blast out a French song. He told us that we we good dancers but I think he was just being polite. The place we are staying in is called Tropicana. The sign at the entrance has a fantastic spelling mistake which describes it as a ‘Bungalove’ rather than a bungalow. The next day, after a classic Malagasy breakfast (baguettes that disintegrate when you touch them), we left to meet the head of medicine for Mahanoro. Dr. Alain presented our plans in an attempt to win him over. With so many introductions on this trip, we have learnt that meetings seem to follow the same pattern. They begin with 10 minutes of stern faced interrogation before a critical moment when we deemed to have good intentions and are trustworthy. After this moment, there’s an eruption of excitement and we are suddenly asked to come and meet yet more people. We were taken to meet the head of education for the area and went through exactly the same process with him. office. They greeted us with a a group ‘bonjour’ and a round of applause. What a privilege. The head of education explained what we needed – a poo sample and a wee sample. The explanation was given in a fantastically over-the-top way, with brilliant actions to accompany his words. The children found this absolutely hilarious. They must think that we foreigners are very odd, coming to Madagascar to collect these samples from them! We left sample pots with the children and they filed away back to their classes in an impressively ordered way. I had shivers soaring through my body and struggled around the market in an attempt to help buy some vital things for our research. By the time we made it back, I was exhausted and had a pretty high temperature. I woke the next day determined to go to the school with the boys and help with day one of the research. It quickly became apparent that I was fooling myself and reality hit. It was really hard waving goodbye to the boys knowing that I’d be completely missing out on a day of research but a horrendous day in bed told me that it was the right thing to do. They returned and looked after me really well, very grateful to have them! Fortunately back to good health today and ready to get stuck into work. Due to leave Mahanoro tomorrow and head into the extremely isolated Marolambo district for the bulk of the research. Can’t wait! Today we awoke bright and early to begin out first day of screening school-aged children for Schistosomiasis. We met the incredible headmistress of the school – Tanambao II in Mahanoro, the previous day to do the traditional malagasy introduction and stamping of documents. 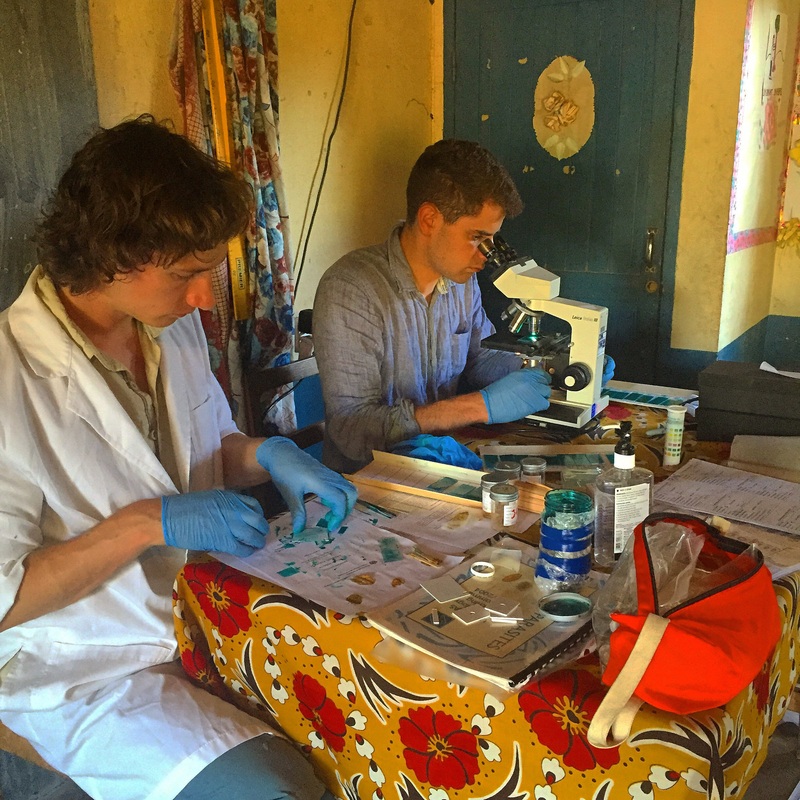 CCA tests diagnosing Schistosomiasis infection. Analysis of faecal samples under the microscope. Looking for elusive Schistosomes! Sampling urine with an audience. The 25 year old guestbook of Tanambao II School. We also deposited the sample pots for the children and the enigmatic Education Chief for the region gave hilariously clear instructions on how to get their faecal samples or ‘caca’ into our pots. The day started with receiving these samples, and despite clear instructions of ‘pea-sized’ amounts of caca, some children felt inclined to be more than generous. The same was true for our urine samples – 10mls is enough, but the children thought it better to fill right to the brim! The enigmatic Education Chief instructs the children on how to collect their samples! Samples reluctantly in hand, we set up our research station in one of the schoolrooms. Imagine a fusion of Victorian school house and a slightly weathered tropical beach house and youll be on the right lines. We delegated tasks, and with Hannah unfortunately running a 39 degree fever back at the hotel, we knew we needed to be efficient. Consent forms were signed and stamps, meticulous records kept. We could put off preparing the faecal samples for Kato-Katz no longer. James and Stephen had run over the methods to the point of exhaustion – it was time to open the pots. With a sizeable dollop of Tiger Balm under the nose the boys spent hours preparing slides with a luminous yellow malachite green stain. Meanwhile, I was in charge of urine for the day. 50 samples were prepared for a point-of-care CCA test (a Schisto pregnancy-type test) and the stopwatch was started. It was incredibly worthwhile to see the tests work, and whilst we knew this meant that some children were indeed infected, we could direct them to curative treatment at the local health centre (centre de sante de basse) that we had secured from the WHO. This was valediction for two years of hard work. We plodded on testing urine samples for blood, looking at the faecal samples and performing CCA. I cannot deny that in the heat of the tropical sun – it was a long hard day. Whilst the surroundings are beautiful, the fieldwork is most certainly not glamorous. The prize for hardest worker was rightly awarded to James who spent the last hour of day ‘recycling’ the faecal sample pots – i’ll leave what that entails to your imagination. At the end of the day we submitted a list of students who had tested positive for Schistosomiasis to the headmistress who will direct them to curative treatment. 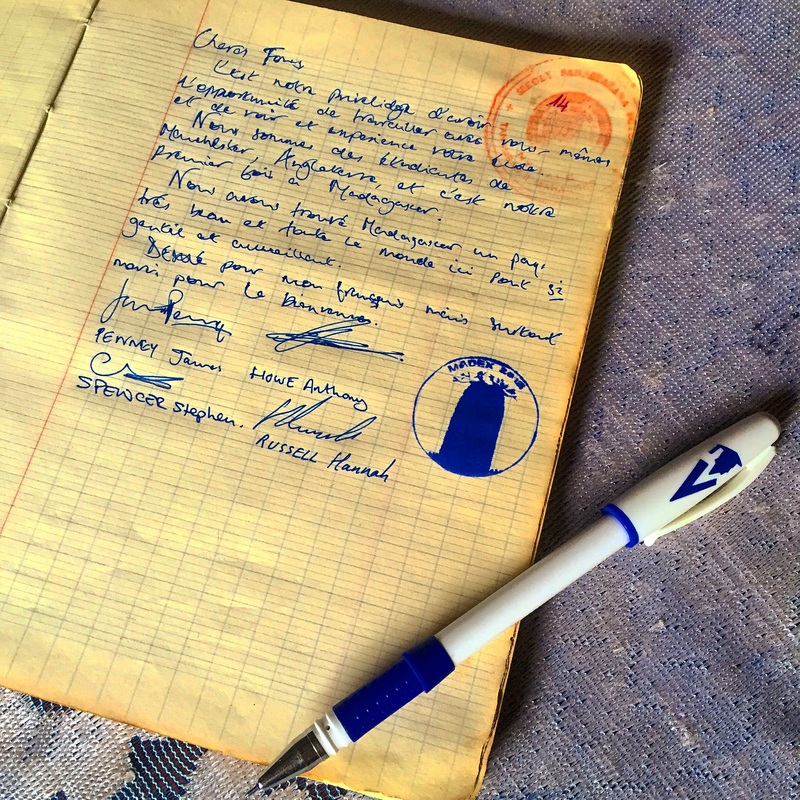 We also signed the 25-year old visitors guestbook and in the traditional malagasy style placed our new MADEX2015 stamp! We left the school exhausted, content and feeling pretty reflective about the sheer privilege that it is to do our work in this wonderful part of the world with these wonderful people. The walk home, despite being laden with equipment and samples, was a pleasure! Looking on to a relaxed evening over our new favourite beer – Malagasy THB (the standard ice-cold bottle being 650mL for 40p!) – we started making plans for the next years expedition. 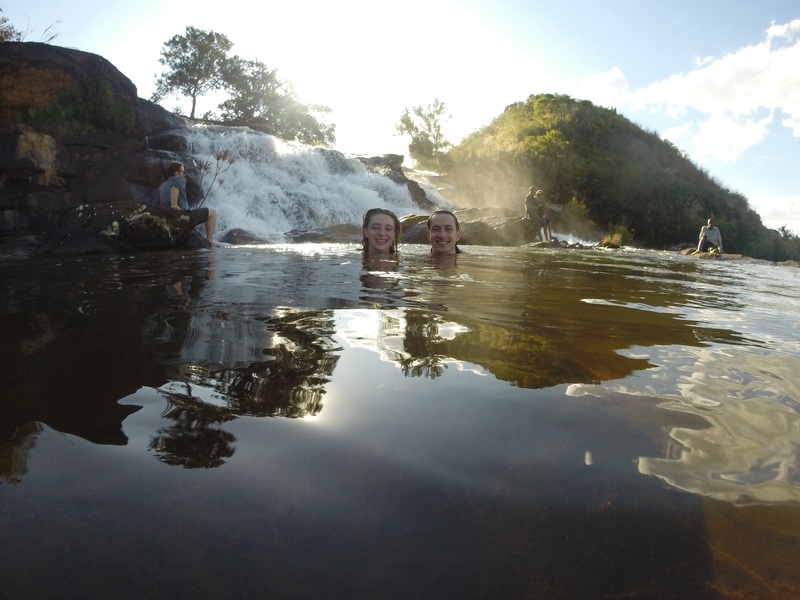 We four have done what everyone said we would do, we’ve fallen in love with Madagascar. Tomorrow we venture into one of the most remote parts of this incredible country for three weeks. With no internet, no running water, and having to carry our quarter of a tonne of equipment, it will be hard but hopefully valuable work. We woke early to pack up our bags in preparation for leaving Mahanoro later today. On our way to the Cyber Cafe, we bumped into Bellarmin (our in-country contact who knows anything and everything about the Marolambo District) and he dropped the news that departure has been pushed back to tomorrow… Of course. The Malagasy have a saying; “m’ora m’ora” which means slowly, slowly. We’re quickly learning that it’s impossible to stick to strict times here and even harder to plan anything beyond the next day. However, if you let yourself settle into the rhythm of life here, it’s quite nice really. It’s a shame to postpone our journey to Marolambo as we are feeling eager to crack on, but I suppose it gives us some more time to prepare our kit for the upcoming research (and to fit in that walk along the beach that we are still yet to find time for). 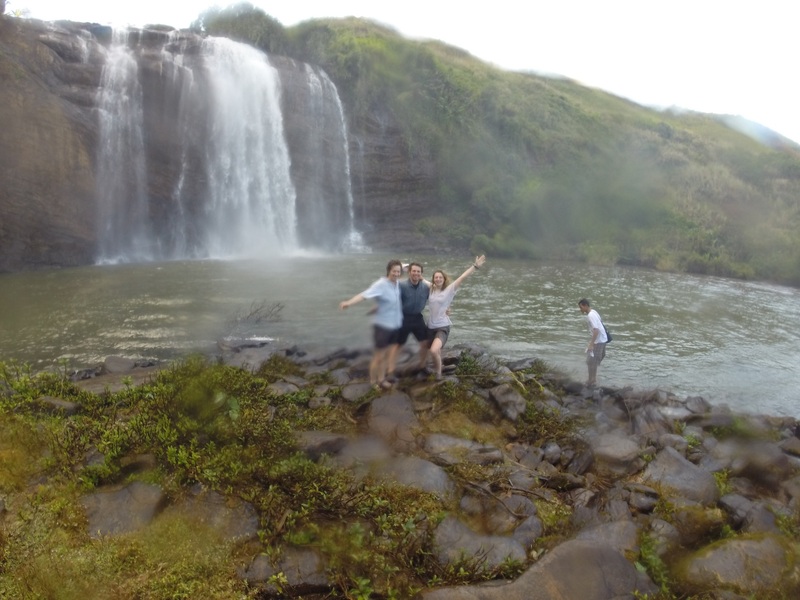 It would be great to upload a detailed itinerary on here however the m’ora m’ora lifestyle makes it very hard! 20.06.15 Leave Mahanoro for Marolambo (who knows what time) in a truck. Have been told multiple times that the road is très mauvais and difficile and we often get a bit of a giggle from the locals when we tell them where we hope to go. The word ‘adventure’ has been used a lot. For the next three weeks – sampling 2 schools a week. 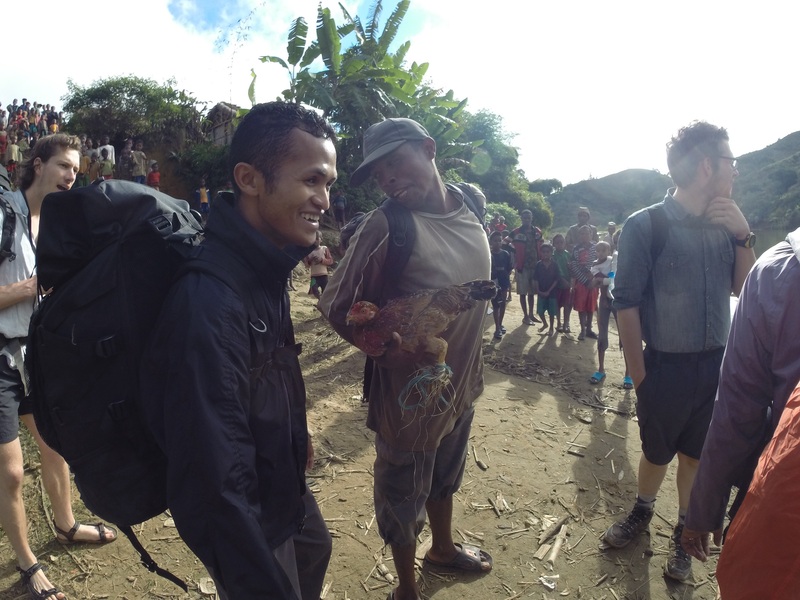 Will involve trekking between villages (in apparently the most isolated part of Madagascar) with all our equipment. Will take faecal and urine samples from children and use microscope to spot schistosomiasis (fingers crossed we manage to carry enough fuel to supply the generator for the entire time). Last night, we went to the closing part of a big conference here. The leaders for the local districts came together to discuss various topics. James gave a great presentation in French to the delegates to explain our plans and we seemed to be very well received. 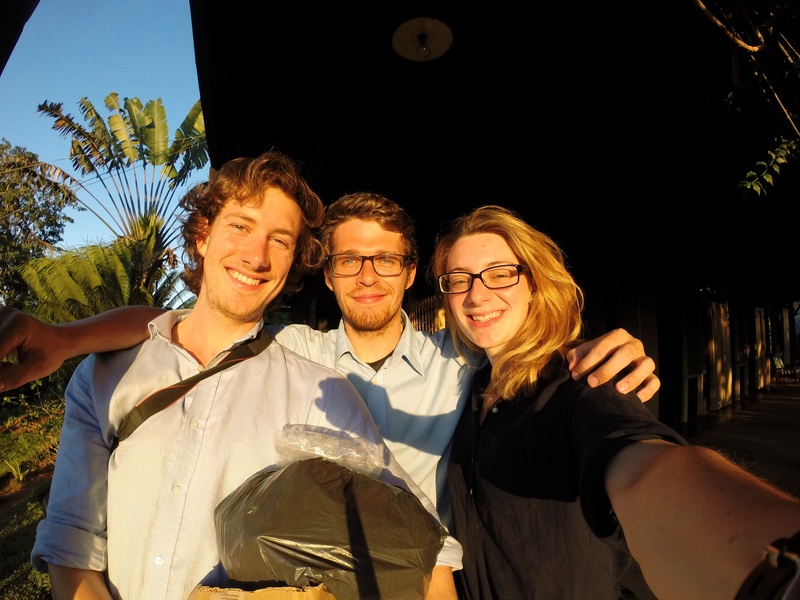 We met our Malagasy team members (they had travelled from Tana that day); Daniel and Anjana and took them out for a meal. They seem fantastic and we are looking forward to working with them. We left Mahanoro for Marolambo at 10am last Saturday (20th June) in the back of a truck (cameon). We attempted sitting along the sides, gripping on the edges, but we were thrown from side to side due to poor road conditions and after 11 hours we were splayed out across the entire truck. Despite this, the journey was incredible with beautifulviews of the countryside and it was fascinating to get a glimpse of village life as we went further through the remote forest. The team in the truck leaving Mahanoro. The drive did not stop here. Just past the half-way point (approximately 50/60km from Mahanoro) we spent the night in small wooden shacks of a hotel that lined the road. The journey continued the following day at 7am and the ‘road’ conditions became progressively worse. 12km away from Marolambo, we came to a stop because a truck in front had crashed into a ditch, blocking the track. We found several willing porters to help carry all extra bags and equipment and hiked the remainder of the way, finally arriving in Marolambo at 9pm Sunday evening, (only slightly battered and bruised from the journey, but all healthy, well and happy). Marolambo is a very special town. Surprisingly, considering its remote area and very very arduous road, it is relatively large and developed – it has a church, Hotel de Ville, and busy market. Several introductions filled the Monday. We met the head teacher of the main primary school in Marolambo (which has 743 pupils), who randomly assigned 80 children to participate in our study. 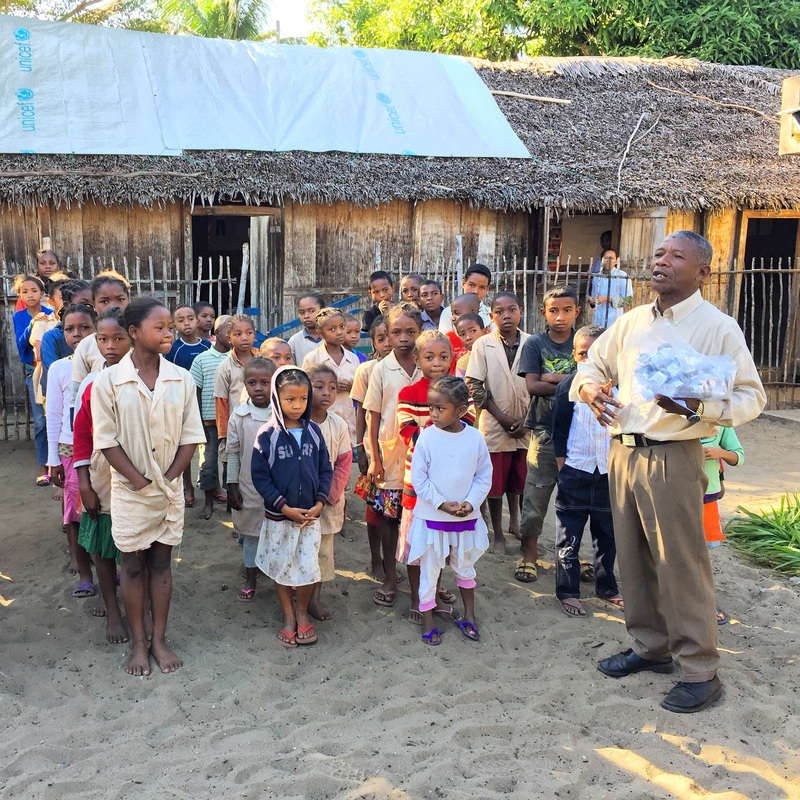 Bellarmin, the head master and our Malagasy student counterparts introduced our project to the children. Embarrassed faces emerged like a Mexican wave and we could tell the children had learned that we wanted their pee and poo! 80 faecal pots were handed out but it left 10 extra young children in the room in tears. Our study group increased to a sample size of 90. Embarrassed and giggling school children being told what the study involves! 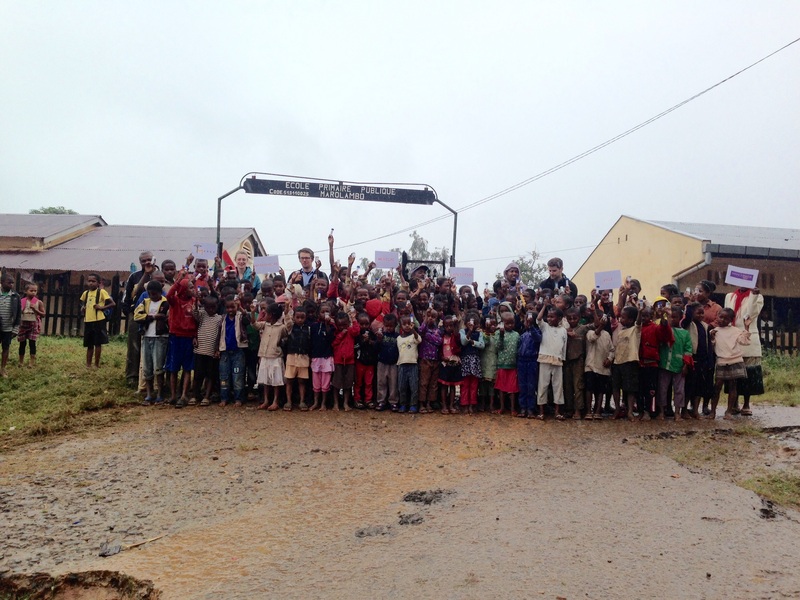 Madex team with the 90 school children who were screened for schistosomiasis in Marolambo. Next stop was to the CSB, with Le Medicine Inspecteur de Marolambo – the chief doctor of Marolambo. She expressed incredibly kind words of gratitude and blessed our team for our work and for the donation of the medical supplies. A ten minute walk took us to the opposite end of the town to the director of education in the area where we decided upon the next 5 schools covering Marolambo and the two villages, Marofatsy and Betampina. The priest has a beautiful wooden house surrounded by a very well kept garden. Much like a palace, the building is situated at the highest point in Marolambo and expresses great grandeur. There is a spare room here with two beds and the priest kindly offered this room for us to stay in. The facilities are equally impressive – a shower with warm water and toilet with a seat! We were very very happy! Unfortunately for me, the following morning meant saying goodbye to this beautiful and peaceful town, and more upsettingly, to my team. A 9 seated plane landed smoothly on a concrete airstrip 30 minutes walk from the town. I spent the next 39 minutes at the front of this small jet talking to the Swiss pilot of Mission Aviation Fellowship (MAF) who takes Charitable and Christian groups to and from various remote locations across Madagascar. We both agreed that flying is the better option and will be our means of transport for any follow-up expeditions! 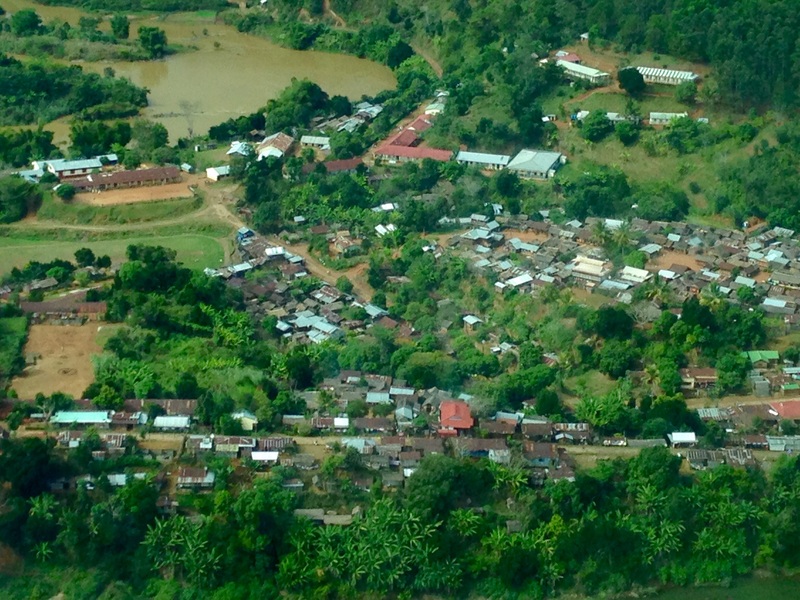 View of Marolambo from the air. If you look closely at the top left, you can see a line of 5 white dots. This is the team in the school playground wearing their labcoats. Since my arrival in Antananarivo I have spoken regularly to my team. They have screened two schools in Marolambo. The first school had a schistosomiasis prevalence of 86.9% and second 92.5%. I met with the ministry of health today who are shocked by the very high rates and will start arranging for mass drug administration to treat the town of Marolambo for schistosomiasis. Needless to say I am devastated to leave at this stage but I am proud and happy of the work we are starting in Madagascar and that my team have settled well in Marolambo where they are safe and in good spirits. We find our first schistosomes, what a fluke! Having sadly waved goodbye to the 9-seater plane carrying Steve back towards Tana (a 39 minute journey compared to the 4 days drive to get here) we now had to pull our reduced team together and make sure we continued the good work. Steve has been absolutely instrumental in this trip, and it’s essential that we pay him due credit here. 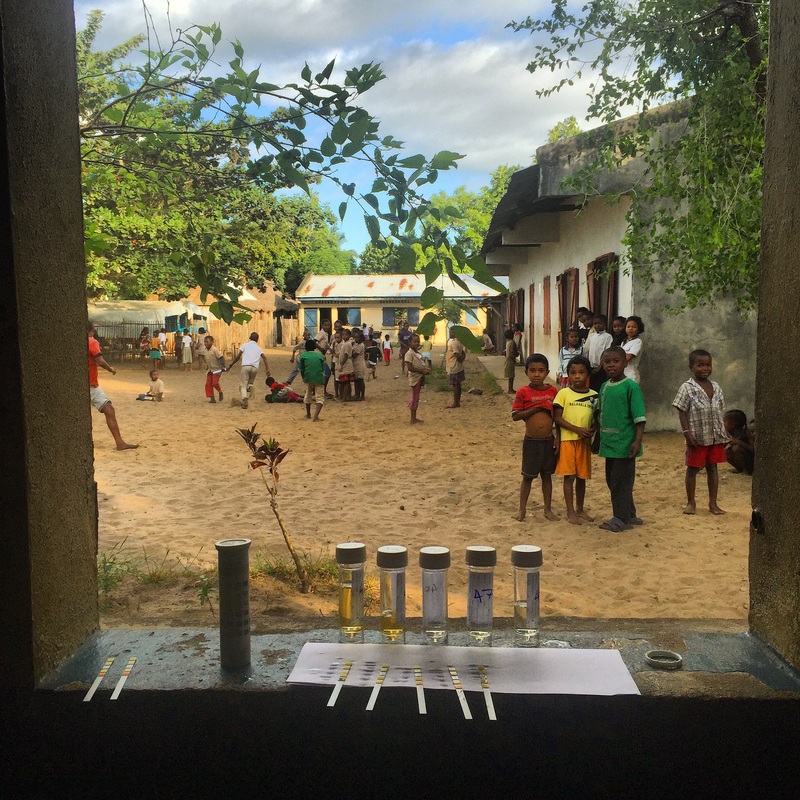 After becoming interested in schistomiasis on a medical placement to Egypt, Steve started firing off emails to WHO Madagascar and others over 2 years ago to investigate the possibility of research in Madagascar. Since then he has put in countless hours of work, in front of and behind the scenes, to make sure that the trip has continued to fruition. Whilst Hannah, Anthony and I have had our share of jobs over the last year, tailoring plans and finalising details, Steve has been there as a constant galvaniser, supplier of advice and reassurance for us, and string puller in all directions to make sure that everything came together. We’re so grateful to have had the opportunity to take on this expedition, and aren’t for a minute forgetting that without Steve none of it would have been possible. The only thing I’ve really seen Steve fail at is in gaining us access to the Gold Lounge in Nairobi Airport. ‘You have not been using your air-miles, Dr. Spencer!’ Ivory Lounge was the best that Steve’s measly air-miles could scrounge, and there wasn’t one in Nairobi, so back to standard non-AC lounge it was for us. Anyway, eulogy over, but thanks so much, Steve, we’re all incredibly grateful. I’m writing from Ambohitelo primary school, which is perched next to the village football pitch right on the banks of the Nosivolo river. For our 3 days here we’ve been given one of the school’s two buildings to double as both dormitory and laboratory. The schoolkids so far have spent their time playing football, performing a kind of elastic skipping rope game, or staring at us as we try to convince our microscopes to work, so we don’t feel too guilty for robbing them of a classroom for a day or two. After Steve left Marolambo we had our first full run of slide preparation and microscope examination with the team that will see us through the next 2 1/2 weeks. A full sample of 70 kids’ poo and pee from Marolambo primary school was obtained, stained, and the entire next day was spent analysing these under the microscope. 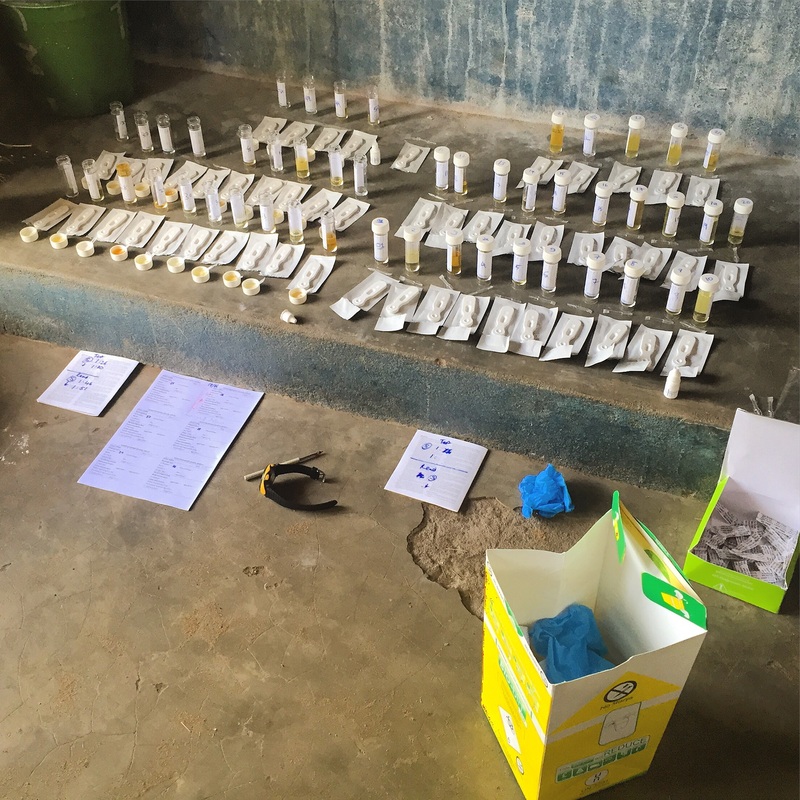 After initial frustration at the slowness of reading each slide, and worried that we wouldn’t have the capacity to continue with our planned sample size, by midday we’d found our rhythm and by the evening we’d gone through 70 slides and had identified our first really high schistosome egg counts. Coupled with the 90+% schistosomiasis prevalence found in the school by urinary antigen tests, these high egg counts indicate intense infection in the area. Whilst bad news for the community, this was confirmation for us that we had come to the right place in terms of looking for areas of high infection, where appropriate interventions could make a significant difference, and so to some extent, real vindication for us of the value of the expedition. 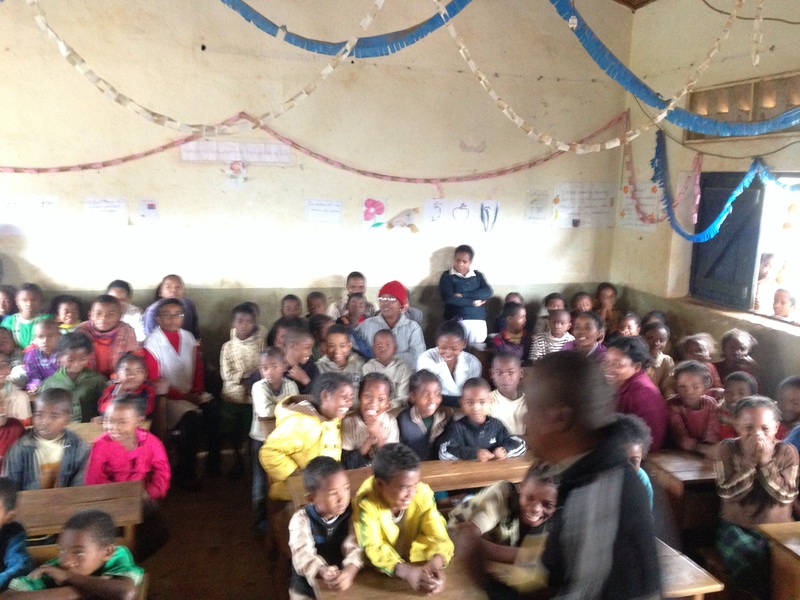 In each school, Daniel and Anjara, our fantastic team members from Antananarivo University, deliver an education programme to the kids about the nature of schistosomiasis and advising how to avoid it and other parasitic infections. They use the school’s blackboards, coupled with some brilliant posters from the UoM Immunology Dept, to emphasise the importance of how handwashing, hygienic eating habits, and awareness of the river as the harbour of schistosomiasis can reduce illness. It’s been very rewarding so far to see the kids really listening to and engaging with the sessions, and then also how parents and teachers will listen just as attentively from the back of the classroom, following up with questions and queries. As well as our additional supplying of drug treatment to the local health centres, we’re hoping that this will help reinforce the long term reduction in the amount of schistosomiasis in the region. 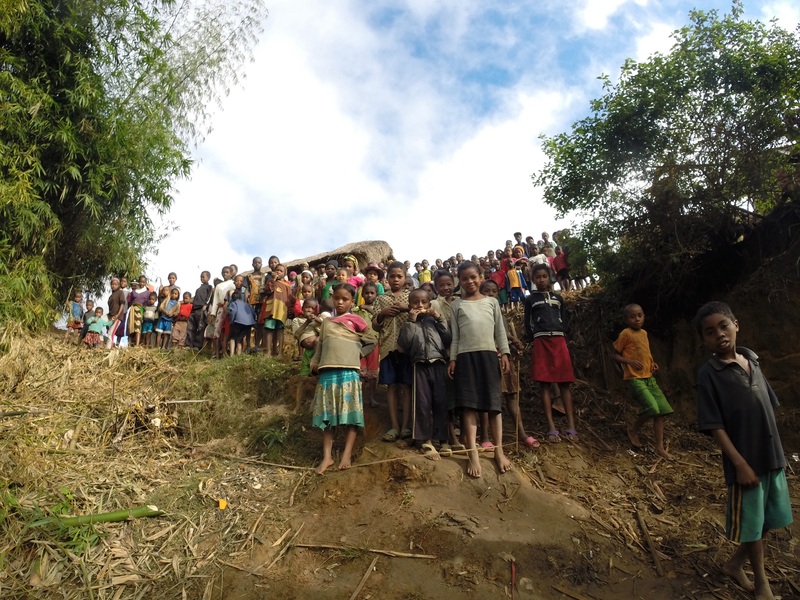 Since Marolambo, we’ve screened another 80 children in Ampasimbola primary school just 15 minutes walk and a log-canoe river crossing away, and have now travelled to Ambohitelo, our third school in the region, 1 hour’s walk up the river. Over the next 2 weeks we plan to screen three more schools, totalling 6 along the Nosivolo. Bellarmin, our envoy and organiser supreme from Durrell Conservation, has accompanied us so far, making the invaluable introductions to the village chiefs and headmasters, without which our work and integration in the villages would be impossible. As I have written this in the dying light, Hannah and Anthony have gone through another 15 slides, Daniel and Anjana have done more brilliant work interviewing the headmaster on his perception of the health needs of the school, and the wife of the village chief has brought us a huge canteen of heavily cane-sugared coffee and a plate of mofokondro (battered deep-fried bananas), for which we are fast developing a taste. It’s a constant privilege to work here. Everyone we have met has been unbelievably welcoming, it’s a fascinating culture to be immersed in for this short while, and whilst sifting through poo 1 day in every 3 isn’t everybody’s idea of a summer well spent, I wouldn’t swap it for anything. 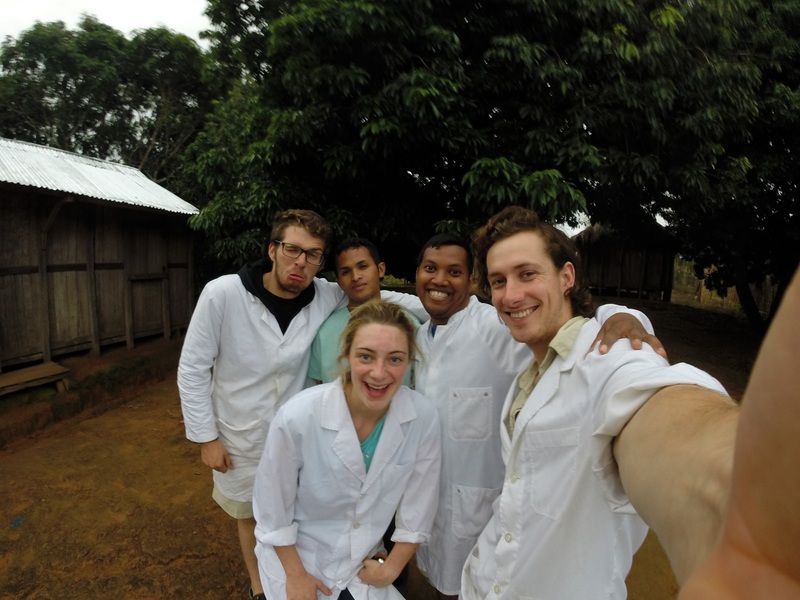 Dr Stephen Spencer and Manchester medical students James Penney and Cortland Linder hope to return to Madagascar. Having identified the extreme prevalence of Schistosomiasis within the communities, they would examine the morbidity of the disease more fully. Additionally, the team will initiate educational programs and investigate local health beliefs, water contact behaviour and barriers to disease control to help facilitate future management.